This homemade wheat thins recipe is so easy and costs a fraction of the price that the store bought crackers cost! They taste amazingly like the real thing. If your family is like mine, they love Wheat Thins. In fact, we can put away several boxes at one sitting! 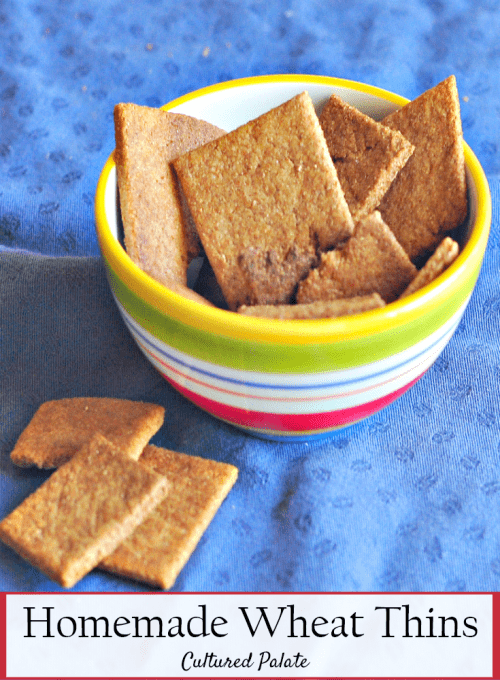 This homemade Wheat Thins recipe is so easy and costs a fraction of the price that the store-bought crackers do! And, they taste amazingly like the real thing. I cannot seem to make enough of them so, I must at least quadruple the recipe! Everyone loves them! Well, nobody wants to marry them (as my children say when someone says they “love it”), but they sure get eaten fast! Sometimes for a variation, I substitute rye flour for the whole wheat – rye has less gluten than wheat. But, whether you are using whole wheat or rye flour, remember they both have phytic acid which is an anti-nutrient and proper grain preparation is important. So, I mix all ingredient the night before, leaving the dough mixed through the night. When mixing, I leave out 1 Tbsp of the water and add 1 Tbsp kefir and continue with the rest of the ingredients. This allows the phytic acid to be broken down and makes the crackers more easily digestible. This actually makes them more convenient because when I am ready to roll them out and cook them the next day, they are ready and waiting. One way to make Homemade Wheat Thins even more quickly is to roll them out on parchment paper. I cut a piece of parchment paper to fit my cookie sheet and then roll the dough right on the paper. Once the dough is the desired thickness, I cut diagonal and horizontal lines to form a grid (using a pizza cutter) and then slide the paper onto the cookie sheet. There is no need to separate the crackers at this point because they shrink as they cook and are separated when baking is complete! I actually found the Homemade Wheat Thins recipe online a few years ago on a site that is no longer available. Since that time, it has become a standard in our home especially since a wonderful summertime meal is cheese and crackers – homemade mozzarella cheese that is! 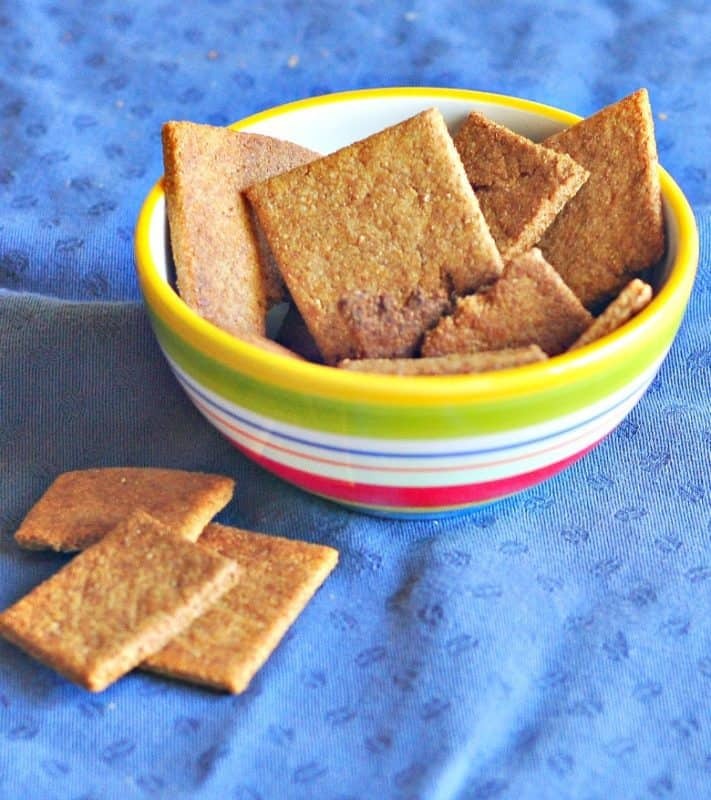 If you’ve tried this Homemade Wheat Thins Recipe or any other recipe on Cultured Palate please take a minute to rate the recipe and leave a comment letting me know how you liked it. I love hearing from you! You can also FOLLOW ME on PINTEREST, FACEBOOK, INSTAGRAM, YouTube and TWITTER. Line a cookie sheet with parchment paper or you can spray cookie sheet with nonstick cooking spray. Add flour, sugar, salt, and paprika in medium bowl and mix. Cut butter into mixture and mix thoroughly - it will be crumbly. Combine water and vanilla in a measuring cup. Add to butter and flour mixture and mix until a smooth dough forms. If it is too dry, add more water. Working with 1/2 of the dough at a time (cover the remaining to prevent it from drying out), roll to 1/16 in thickness right on the parchment paper lined cookie sheet - OR - If not using parchment paper, roll the dough on a floured work area and turn frequently to prevent sticking. Bake until crisp and brown - 8 - 12 min. Check frequently because they burn quickly. Remove from oven and cool. Store in airtight container. Your crackers look so perfect! You must have a very steady hand to cut them so well. 🙂 How many crackers do you get from this recipe (as given)? About how long do they last in aN airtight container? A few days? I’m thinking about trying them out, but I’m the only one in the house who would eat them (Odd, I know! lol) and I wouldn’t want to have too many. This recipe makes about 5 dozen1 1/2 inch crackers nad they should last for quite awhile in an airtight container – I really can’t tell you specifics though because they are eaten too quickly around here! I love wheat thins so definitely going to try this recipe, looks very easy, thank you!